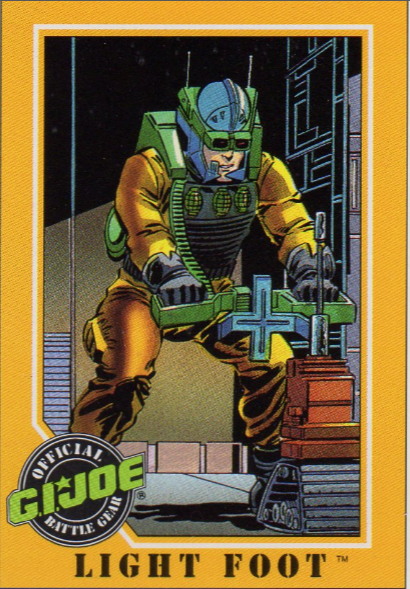 We have arrived at Impel Trading Card #65 and again the definition of the codename is worrying to say the least. The Urban Dictionary describes it as: when presented with a long list of complicated tasks and one takes the easiest possible route, doing things incorrectly and cutting corners to the extreme. 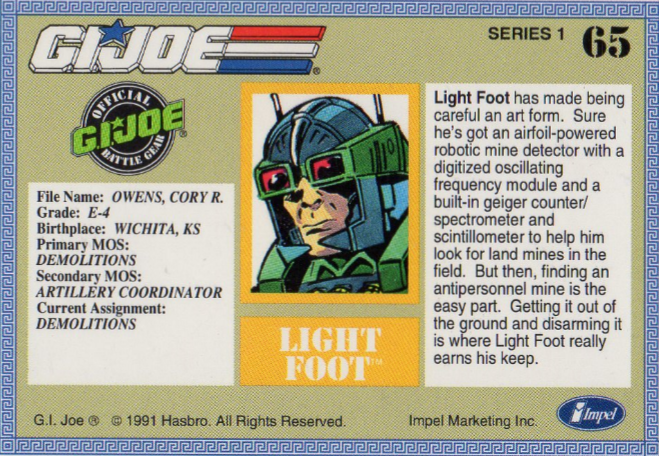 Just the person you’d want to be taking care of your explosives… Ladies and Gentlemen, this is #65, Light Foot. I have to admit, although Light Foot is one of the first more colorful (I’m being polite here) Joes to be released at the end of the 80’s, I really like the figure. I can’t remember when exactly I got the figure, but I do remember him playing a big part in my backyard stories. We are first introduced to Light Foot in the Special Missions #13 where he – as a probationary Joe – is part of the team assigned to destroy a secret bunker. He is teamed up with another Joe trainee, Mangler, and Veteran Joe’s Dusty and Outback. The team gets captured and tortured, and Light Foot spills all there is to spill about the mission. Mangler gives him a hard time about it, but in the end, Light Foot carries out his mission and Mangler gets … well, mangled. In the regular run of the Marvel comics, Light Foot first appears in issue #82. They reference to his injury in the Special Mission, and he tells that because he got injured and couldn’t finish the training. He makes it again this time and together with Repeater and Budo, he is accepted into the Joe team. They don’t get the rest they deserve after the harsh training, when they have to stop a raid on the Picatinny Arsenal. Cobra is able to airlift the truck, but Light Foot had placed a time-delayed mine on the cabin making the truck and helicopter go WHAM in mid-air. Unfortunately, Light Foot doesn’t appear in the cartoons. As far as figures is concerned, only 2 official versions were ever released. The second being a repaint to fit Light Foot in with the Night Force team, he was released carded with Shockwave. As I mentioned above, I really like the figure and it’s a shame only 2 versions (1 mold) were ever made. I think that the FSS of the G.I. Joe club could have benefited from a new and updated version of Lightfoot. Maybe in 2020 with the reboot, we’ll get a whole bunch of new and/or updated toys… One can only hope, right? Next time around, we’ll have a clerk typist in, so I’d better check my spelling. Next Next post: Is the typewriter mightier than the missile launcher?